We had the privilege to fish out of the Rocky Brook Camp which was built in the early 1800’s by the International Paper Company. Rocky Brook Camp is an elegant river lodge surrounded by 497,00 acres of Canadian forest and has seven miles of private water on the Miramichi River along with several major salmon holding tributaries including: Falls Brook, Rocky Brook, Sisters Brook and Clear Water Brook. To many anglers the Atlantic Salmon is considered the ultimate fly fishing prize and the Miramichi River has always been legendary water made famous by the sports great fly fishers like Ted Williams and Joe Brooks. Many anglers fish for years and do not even hook, little lone land, an Atlantic Salmon. This was my son’s fourth day of fly fishing and as you can see from the first photo he landed a true trophy. The fish was hooked above the bridge on Clear Water Brook and it took Trent and his guide Jeff almost an hour to get the fish to the net. 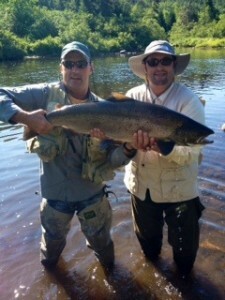 This Atlantic Salmon measured 41 inches and weighed 30 pounds! It was taken on a 9 wt. fly rod and the fly was a #6 Green Machine. This was the largest Atlantic Salmon released at Rocky Brook Camp since 2004. You just cannot imagine how happy I was for Trent as this is really a fish of a lifetime. I am pretty sure that Trent will be making more fly fishing trips with me in the future. The middle photo was taken at the 100 foot water fall on Falls Brook. 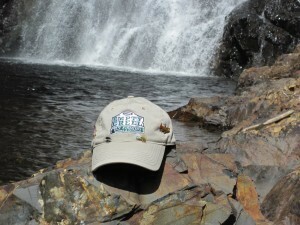 The Empty Creel Guides and Outfitter hat displays some of the salmon flys we used during the week. 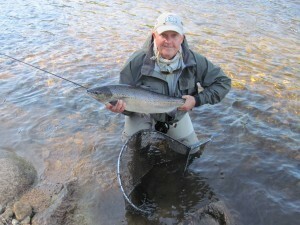 Check out the rest of our Atlantic Salmon photos in the Gallery section of our website. Caddis and I will be back on the Little Red River in Arkansas next week and if you want to find out more about Atlantic Salmon fly fishing just contact us at info@emptycreeflyfishing.com, or give us a call at 479-459-7071. Thanks to my son, Trent, for a most memorable fly fishing adventure! !